Here on Our World 2.0, we frequently talk about the importance of Sustainable Energy for All, and often the focus is on providing clean energy to those who live in areas outside of existing electricity grids, or in rapidly developing countries with surging power needs. However, even in affluent countries there are many who desire green energy sooner than their socio-economic situation would normally allow. That is why we are excited to share this story about a model that will hopefully blossom in disadvantaged communities around the globe. Because most of those in poverty cannot afford the American dream of homeownership, many of them rely on affordable single or multifamily rental housing. Of the more than 40 million rental households in the United States, nearly one out of four reported extremely low incomes according to the U.S. Department of Housing and Urban Development. Furthermore, the Department of Health and Human Services found that low income households spend up to 16.4 percent of their income on residential energy services, while the average household spends just 7.2 percent. These households disproportionately represent the elderly, disabled, minorities, veterans, and female-headed households. With the number of renters on the rise and poor families excessively burdened by high energy prices, we must increase access to affordable distributed generation resources. One option is to expand the use of Community Solar Garden (CSG) programs. CSGs are communally-owned solar installations that sell power to local utilities, providing credits to their investors’ residential electricity bills. CSGs can deliver cheaper energy through economies of scale and do not require rooftop installation, making them a valuable option for renters. Colorado is a leader in CSG and provides an excellent model from which to build. 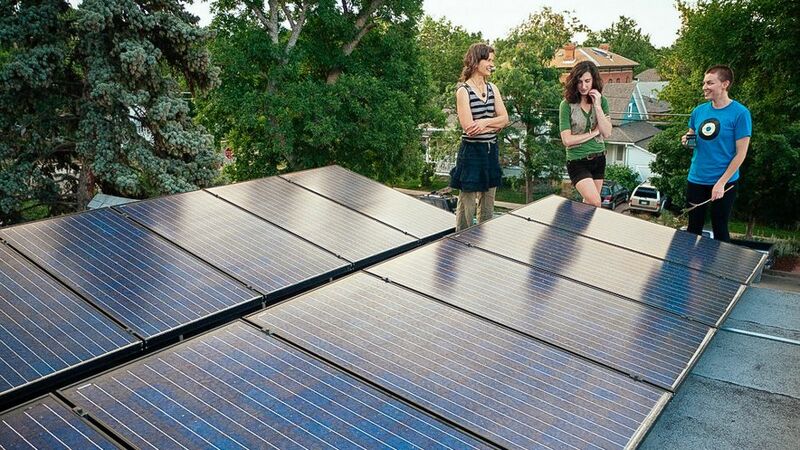 In 2010, the Colorado Community Solar Gardens Act (CCSGA) made the state one of a few that allows CSGs. Various studies have suggested modeling legislation in other states after the CCSGA because it greatly increases access to solar technologies. Most importantly, the Colorado bill includes a 5 percent carve-out for low-income investors who can only afford to purchase a smaller portion of power from the solar installation. As a result, these investors can purchase shares of power for as low as $10, rather than having to buy four or five panels. Further expansion of CSGs throughout the country will require cooperation from utilities and regulatory boards. State governments and Public Utilities Commissions (PUCs) should work with utilities to determine fair standards for Community Solar Gardens within their jurisdictions, and should use Colorado as an example. Furthermore, the federal government should act to extend federal incentives for solar to CSGs. To support CSGs at the federal level, Sen. Mark Udall (D-CO) has introduced the Solar Uniting Neighborhoods (SUN) Act of 2013, which extends the 30 percent Federal Investment Tax Credit for solar power to CSGs. The bill helps tax-exempt entities like municipal utilities or rural electric cooperatives pass along tax credits to their residential customers who invest in CSGs. This provides communities both an incentive to support clean energy and relief from high energy burdens. Udall’s SUN Act is an excellent first step toward promoting CSG programs across the country. The next step should be to promote CLEAN Contracts for community solar. Without sufficient tax liability, low-income Americans cannot benefit from the ITC at the same rate as wealthier customers. A CLEAN Contract, similar to a Feed-in Tariff, will allow everyone to reap equal benefits from solar incentives. Utilities should work with municipalities to institute these programs within their jurisdiction. Low-income Americans can have better access to clean energy if public officials at all levels of government — along with private utilities — promote smart, accessible solutions like these. This article from Climate Progress appears with permission. Solar gardens: Clean energy within reach of low-income families by Bryan Lewis is licensed under a Creative Commons Attribution-NonCommercial 3.0 Unported License. Bryan Lewis is a renewable energy finance intern at the Center for American Progress.